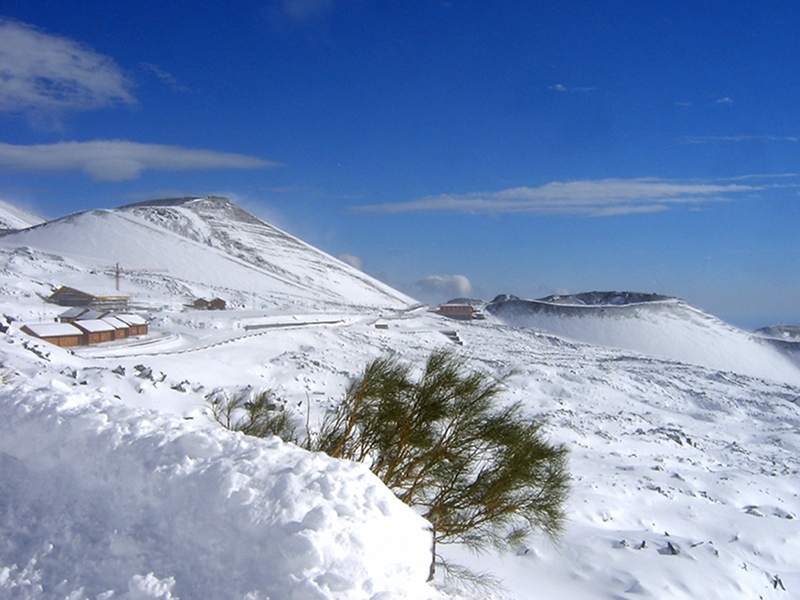 Among the volcanic cones of Etna, the Montagnola is one of the most impressive. It is situated in the south of the Central Crater, on the upper southern slope where it rose at 2,500 meters of height after the eruption in summer 1763. Silvestri Mountains formed after the eruption of 1982 along a radial fracture (called "bottoniera") from which 5 eruptive cones emerged. Between Mt. Silvestri Superiore and the one immediately below, called Mt. 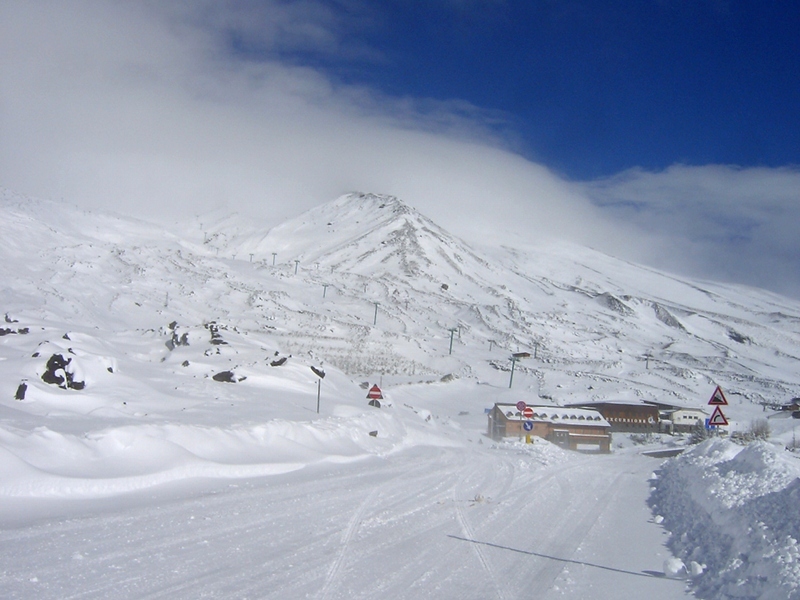 Silvestri Inferiore, there is the road leading from Zafferana and Nicolosi to Sapienza Mountain Hut, an obliged destination for the visitors of the southern slope of Etna. 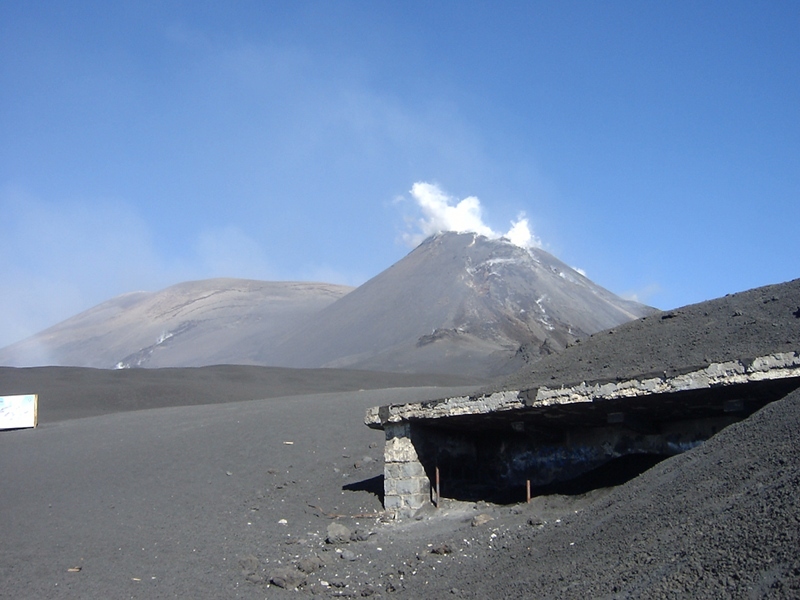 The summit of the volcano is currently made of the Central Crater (Voragine and Bocca Nuova), the northern-eastern Crater (1911), and the southern-eastern Crater (1971). The height of the volcano is of about 3,340 meters above sea-level, but this varies because of the accumulation of the material deriving from the explosions on the one side, and on the other because of the frequent collapse of the walls. Within the Park there are over 200 caves formed by the lava stream. Known since the past, they have been used by man as sacred or burial places, shelters or storage places for snow when this was the only form of refreshment during the summer. Among the most famous there are: the caves of Lamponi, Tre Livelli, Gelo, and Palombe. Bove Valley is one of the most important naturalistic areas of the Park. It is an enormous basin situated on the eastern slope of the volcano, which, according to some theories, is the result of the collapse of the original crater complex. The basin is 7 km long and 5 km wide, with walls which reach the 1,000 meters of height. In the night between the 13th and 14th of December 1991, at about 2,400 meters of height, there was an eruption which gave birth to a lava flow which lasted until the spring of 1993. 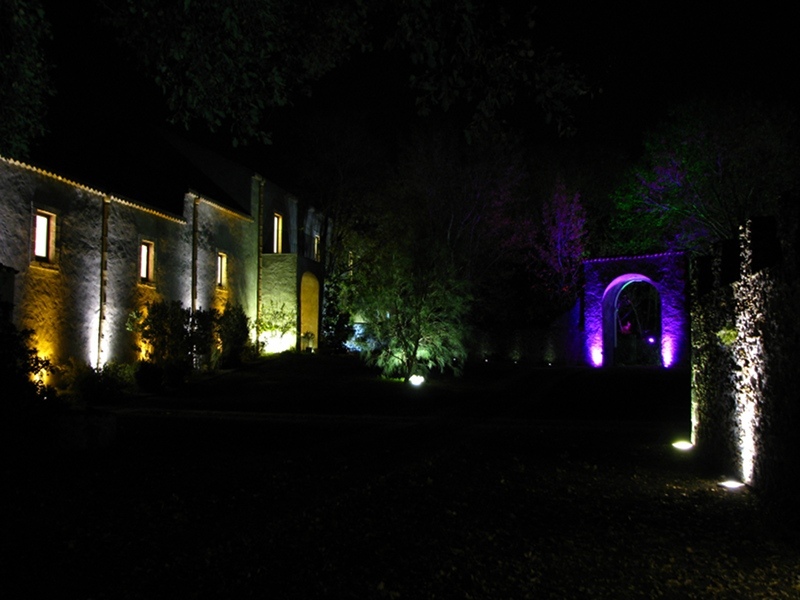 In spring 2005, Etna Park Authority inaugurated its new head offices in the former Benedictine Monastery of San Nicolò La Rena, ancient building of great historical and architectural value around which the community of Nicolosi was born and developed. 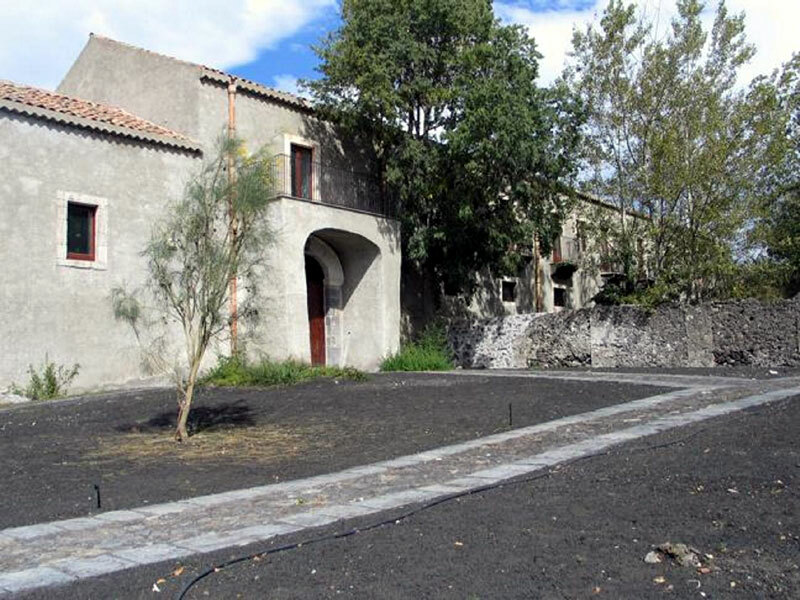 The Monastery, recovered after years of abandonment thanks to difficult works of preservation, represents for the people of Etna and for the visitors coming from all over the world a place of culture, nature, and promotion of local products. It also represents an essential reference point housing important cultural and scientific events and environmental education initiatives. Among them, the 6th National Congress of the Italian Federation of Parks and Nature Reserves (Federparchi), held in 2006 and welcoming all the protected areas of our Country. 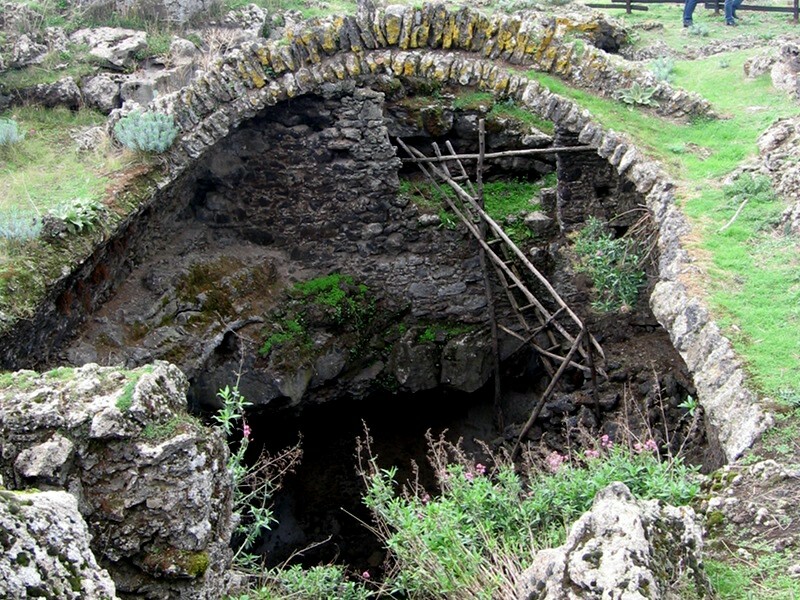 Beyond the entrance palace, built ex novo with the function of "front office" of the Park Authority, the ancient path in lava stone and a fascinating arch lead to the area in front of the Monastery, characterized by the presence of the "four mouth" reservoir, still working with its four wells. On the ground floor, probably the ancient cellar of the Monastery, you will find a volcanological museum illustrating the main features of Etna: its geological history, the caves, the lava flows, the "volcanic bombs". 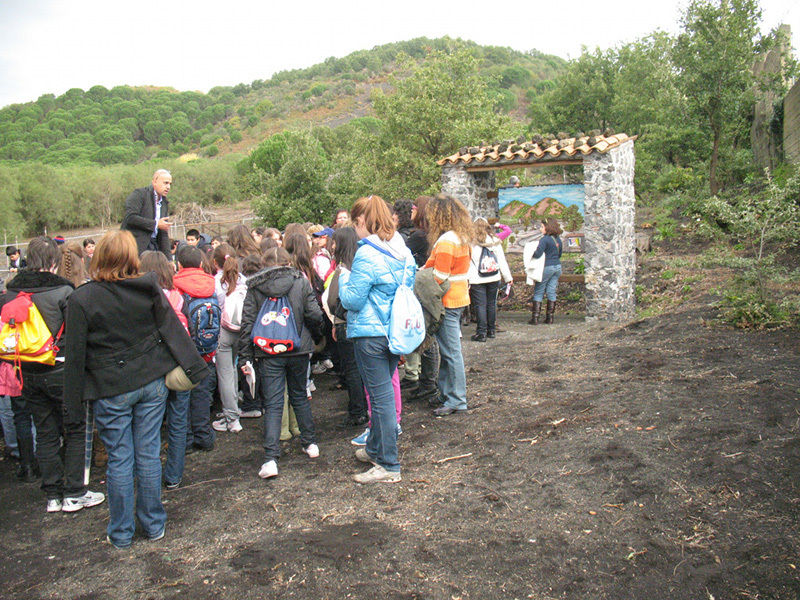 In front of it, the reconstruction of the rural world of Etna. Moreover, the same premises house the library and the data elaboration center. Always on the ground floor, in another section, there is the Park conference hall, where the old church used to be. It preserves some frescos and inscriptions surviving the long period of decay before the renovation works. On the upper floor, the "cells" of the Benedictine monks house almost all the Park Authority offices. Behind the building, you will find the enclosure with the ruins of the original Monastery and, next to it, the old millstone, today still closed but bound to become the Museum of wine-growing of Etna. Finally, next to the head offices, there is the large area (about three hectares) with the collection field of the Germplasm Bank of Etna and the Trail of the Germplasm. 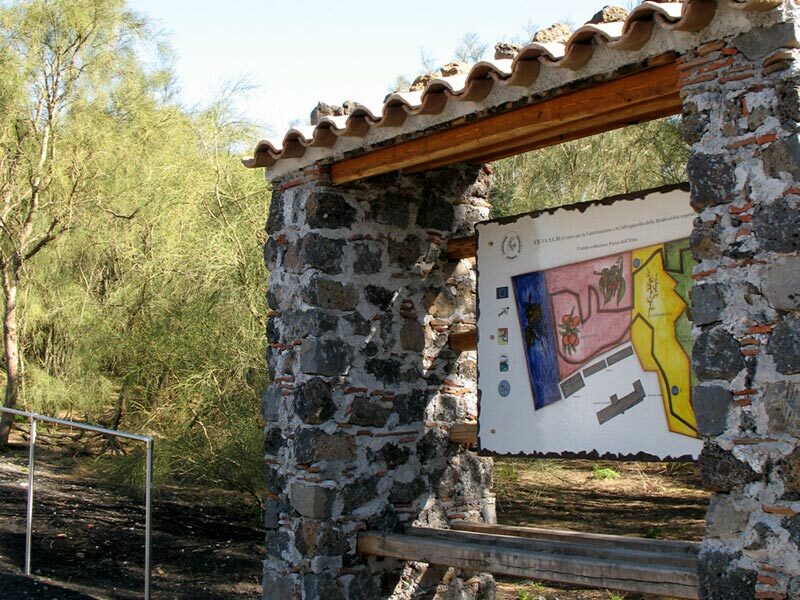 Near the main building there is a digital seismic station and a station for the chemical survey of gases, installed by the Park Authority within the agreement with the National Institute for Geophysics and Volcanology. The whole Monastery area is now accessible for people with disabilities, for visually impaired people, and for blind people. The collection field of the Germplasm Bank has been created for the characterization and preservation of the vegetable genetic heritage of Etna. It covers a surface area of about three hectares near the Park Authority head offices and houses species of naturalistic and agricultural interest (vineyard, orchard, broom thicket, plants of forest interest), but also aromatic and medicinal species growing in the territory of Etna. The area is managed according to the organic production method established by Reg. CEE 2092/91 with its following changes and integrations. The Germplasm Trail, 1,153 meter long, develops across the collection field with slopes lower than 7% and with a road bottom allowing the transit also to special means used by people with motor disabilities. In particular, in association with Stamperia Braille from Catania, special environmental interpretation labels for visually-impaired and blind people have been installed. Therefore, a real "Trail of the Five Senses" has been created, giving the opportunity to visit the area also to people with physical problems, through the recovery of the contact with nature and the natural potentialities of the use of our senses. In order to achieve these aims, Etna Park, together with some Departments of the University of Catania, has created a consortium, called CEVASABI (Center for the enhancement and safeguard of the biodiversity of Eastern Sicily), including the Botany Department and the Botanic Garden of Catania, the Department of Vegetable, Flower, and Plant Growing and Agricultural and Food Technologies (DOFATA), the University Center for the Safeguard and Management of Natural Environments and Agricultural Ecosystems (CUTGANA). The collaboration of several Authorities and institutions was essential: among them, the Regional Councillorship for the Territory and the Environment, supporting the actions of the Park Authority; the Regional Councillorship for Forests and Agriculture; the Regional Agency for the State-owned Forests, in charge of the measure that enabled the creation of the Germplasm Bank together with the local SOAT; the University of Catania; Stamperia Regionale Braille; the Regional Councillorship for Tourism, that with the funds of the project "Turismo Verde" (Green Tourism) enabled the improvement of the accessibility to the germplasm trail and to the Park head offices. Such synergy, thanks to which Etna Park aims at being one of the first institutions that contributed to the achievement of the Goal 2010 for the reduction of biological diversity loss, represents an example of experience aimed at achieving the goals for a life quality improvement.